Jerome Grand Hotel is a Spanish Mission style building, constructed in 1926, started out as the United Verde Hospital, opening January, 1927. In 1930, it was written up as the most modern and well equipped hospital in Arizona and possible the Western States. The Hospital was closed in 1950 as the mine operation was being phased out. The building stood unused for the next 44 years until the rehabilitation plans started in 1994. The building is one of the highest public structures in the Verde Valley, (5240 Ft.). As the last major building constructed in Jerome, the building was not only to boost the pride of the town in its classic design, but was built fire proof and able to withstand the blasts of up to 260,000 pounds of dynamite set off by the mine and sometimes felt as far away as Camp Verde, a distance of 20 miles. How this 30,000 sq. ft., five level building of poured in place, reinforced concrete, was constructed on a 50 degree slope is an engineering marvel even by today's standards! In 1994, Phelphs Dodge sold the United Verde Hospital building to Larry Altherr and his brother, Bob, who began turning it into the Jerome Grand Hotel. When it opened its doors in 1997, the hauntings began again. 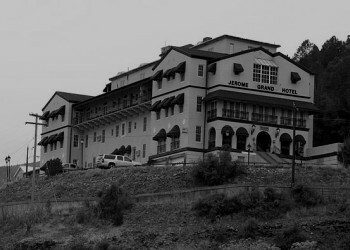 "What makes the Jerome Grand Hotel a worthwhile place to stay, is the fact that this is probably one of the most active haunted locations in the world," according to ghostlyfavorites.com. "Due to the high level of activity in the hotel, it is a quite popular destination for amateur ghost hunters." There are stories of strange noises coming from empty rooms; coughing, labored breathing, and even voices. Sometimes these noises come from a dark corner of a guest's room! Others report lights or TV's turning on and off. There are unexplained smells of flowers, dust, cigarettes and whiskey. Ghostly presences and unexplained activities lure many to this haunted hotel. Two female apparitions have been seen by numerous visitors. The first, a nurse carrying a clipboard, seems more to be a memory than an actual ghost. She roams the halls, pausing at intervals and leaning down, looking at beds that no longer exist and patients long since dead. The other, a woman in white, has been identified as a woman who died in childbirth. Neither she nor her baby left the hospital halls. According to legend she is distraught over the treatment of her dead child, who was buried in an unmarked grave. According to the locals, she stalks the hotel, searching for her child's final resting place. Experience the thrill of the ghost hunter night at the Jerome Grand Hotel. See the elevator shaft where the famous ghost, Claude Harvey, was found. Although his death was ruled accidental, hear the suspicious circumstances surrounding it! Go floor to floor in search of orbs and apparitions using state of the art equipment. Capture the ghosts on camera if you can.